The charming highland towns of Da Lat and Sapa have been listed in the Top 10 rising destinations in Asia in 2017 by popular travel website TripAdvisor. The Travelers’ Choice awards for Destinations on the Rise has been released, based on millions of travelers’ review ratings for accommodation, restaurants, and attractions on TripAdvisor, with an increase in booking interest in over 43 selected destinations around the world. Located at 1,500 meters above sea level in Vietnam’s central highlands, Da Lat came in at Number 4 and Sapa, in the northern mountains, at Number 6 in the Top 10 list. Known as the city of eternal spring, the city of flowers, and the city of love, with blooming flowers everywhere all the time in the town and valleys and a temperate climate with an average annual temperature of 17.8C, Da Lat is recommended as a romantic place for lovers and also a cool respite from Vietnam’s year-round hot weather. The former colonial hill town is full of beautiful French-era buildings and surrounded by pine trees, flowers and vegetables farms. In January, the New York Times also recommended Da Lat among 52 places to go in 2016, describing it as “an agricultural El Dorado” with unique scenes of pine forests, locally grown avocados, and artichoke tea. Tourists are recommended to visit Linh Phuoc Pagoda, an intricate structure built in 1950 with ceilings, walls and installations made from millions of pieces of broken glass, terracotta and beer bottles, Truc Lam Zen Buddhist Temple, and the roaring Elephant Falls, where they can have adventures with rafting, mountain biking and canoeing. 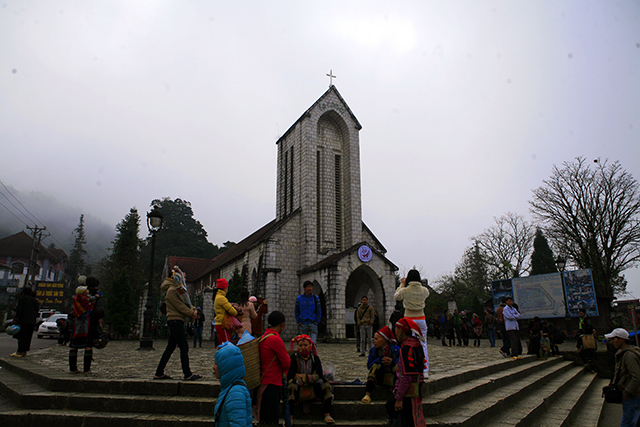 Meanwhile, Sapa is known for its terraced rice fields and trekking trails. The harvest season in October is amazing for both sightseeing and trekking, with beautiful yellow rice paddy fields, according to the site. Tourists can also visit the Saturday night “Love Market”, the Gothic stone church in the town center that is a reminder of the French missionary influence, and many Vietnamese and European restaurants downtown. Other favorite destinations in Asia were Malaysia, which had three entries, Azerbaijan, India, the Philippines, South Korea and Taiwan. Visitors can also learn about interesting culture by traveling through hill tribe villages. Foreign tourists to Vietnam hit a record high of 9 million in the first eleven months of this year, up 25.4 per cent from a year ago, according to Vietnam National Administration of Tourism (VNAT).